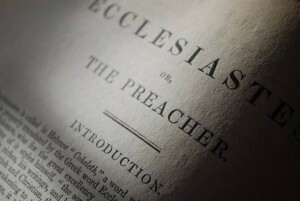 For students in my Wednesday night class on Ecclesiastes, “Questions for Discussion” and notes for the Chapters 6 are now available online. I will NOT be passing out handouts for this class, so these documents are for those who would like a copy of the questions (and my notes) for use in the class. The questions will be displayed on-screen during our time together. Lord willing we will cover these questions tomorrow night at Bellevue Church of Christ! The class will be in the auditorium at 6:45pm (weather permitting).